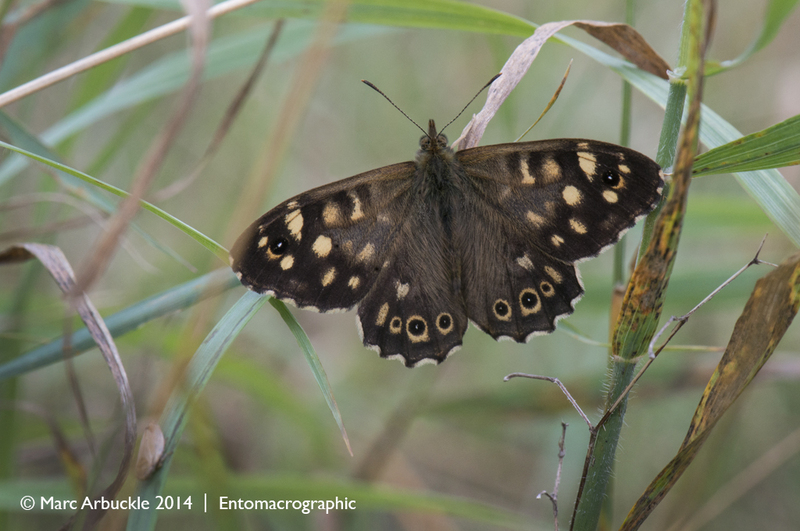 The Speckled Wood Pararge aegeria seems to be having a good year in Wiltshire. Whenever I’ve ventured near a patch of sun dappled woodland it’s magically appeared. Darting out to give me the once over before spiralling skywards for a honeydew top-up or returning to a favourite perch to soak up just a little more sunshine. It’s always a welcome sight in my eyes but these adults will soon be gone as Autumn’s chill is upon us. This one looks to be a male. It’s unusual as it is the only butterfly in Britain that can survive the winter as either a larva (caterpillar) or a pupa (chrysalis) before emerging again in the spring next year. Although it’s believed the caterpillars need to have reached their third instar (moult). Get out and enjoy them while you still can. Nice lighting! Do you use a flash? I like the “eyeballs” around the edge of the wings. If I were an insect — I would certainly be fooled. Thank you. No I don’t use Flash. I have a flash unit but to be honest I don’t really know how to use it. I think it would be useful though to bring out more detail.